The WBC Heavyweight title bout tonight has been given an added bit of spice after Dereck Chisora slapped the Champion Vitali Klitschko at the weigh in but we wouldn't want to make too much of that as the line between pro boxing & pro wrestling style antics seems to be more blurred by the year. It seems amazing that Chisora has this 'opportunity' at this stage of his career as he's lost two of his last three fights, first to Tyson Fury & then last time out in an admittedly disputed decision to European Champion Robert Helenius, his shot at the title shows how shallow the depth of the heavyweight division really is. 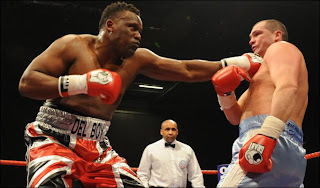 Chisora is a full 7 inches shorter than Klitschko at just 6 feet tall & his reach is 6 inches shorter than his opponent too making it very difficult to see how he'll land a puch unless he gets on Vitali's inside. Getting on the inside of Vitali Klitschko is easier said than done as he has such an outstanding an concussive jab that regularly keep opposing fighters from getting close that has contributed to him never having been knocked down in his career with his two losses coming courtesy of a retirement when winning & thanks to a cut eye against Lennox Lewis who he was up against on the scorecards. Other than those two unfortunate losses Klitschko has won 43 fights with 40 coming by knockout or technical knockout & that is the key stat here, Chisora is a low grade fighter up against one of the most dominant heavyweights of all time & the one with the best knockout ratio of any heavyweight champ ever. We make the Klitschko win by knockout around 1/10 by our odds & can barely believe him winning by any method is only 1/12 as this is a massive mismatch, instead you don't have to be the heaviest punter around to get on the 2/5 for Vitali to win by knockout on Betfair. Klitschko often does his damage by repeated punches rather than one killer knockout blow & in 9 of his last 10 fights he's won by knockout in the 8th round or later & Skybet offer a very tempting 7/2 for Klitschko to win in rounds 9-12, for an individual round bet we'll go for Klitschko in round 10 at a price of 14/1.